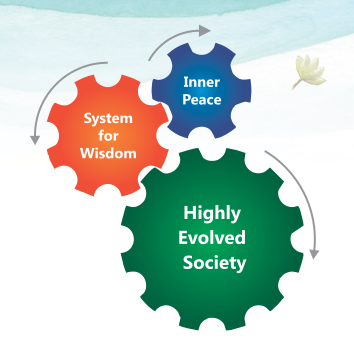 The mission of the Foundation is to create a highly evolved society. A society where individuals give top priority to self-realization and accessing consciousness first. A society where businesses exist as an expression of Self. A society where the key department in every government is the ministry of higher consciousness. A society where all nationalities races and religions co-exist happily and resolve their differences through dialogue and vision. We all know that peace is our natural state and can be easily accessed. But ignorance shrouds peace to such an extent that only symptoms of the absence of peace can be noticed. When the veils of ignorance are removed, we realize that we are not supposed to be peaceful; rather, our essence is peace. When we feel this peace within, it automaticallyexpands and transforms our world, leading to World Peace. The more we are established in peace, more is the love that flows for others because in the experience of oneness, we realize that there is no other. This love is true love which is unconditional and boundless. The more we operate from this natural state, our sensitivity keeps rising and so does our understanding. By reminding ourselves and by accessing the peaceful natural state within, we attain supreme consciousness. We attain the final truth - also called self-realization. Further, we can stabilize in the experience of self- realization. Hence when everyone accesses and operates from this peaceful natural state, a highly evolved society also called can be formed. Importance is given to the common thread of consciousness in all religions rather than sectarian beliefs and myths of religions. Where movies and media promote happiness, non-violence, and love. Children are taught how to access the peace within. Youth are taught how to fortify their character with kindness and compassion. Such a society is possible if the unshaken flame of peace within us (and within which we exist) is accessed. The glue that binds such a society is already there. It is the glue of higher consciousness that binds members of such a highly evolved society in oneness.